Every year we receive hundreds of unsolicited manuscript submissions and most of those are sent with requests to meet with publishers. In the demanding day-to-day busyness of a publisher, it is difficult to allocate each bidding author a one-on-one appointment. If a submission doesn’t grab us right away, if that first paragraph isn’t gold, it gets a quick, but we hope, kind response; try another publisher, join a writing group, try reading more, these are some of our fairly stock responses. But we wondered if there wasn’t another way, something to add value to these proposals, to make us all more interested, and from that wondering Pitch to Publication was born. 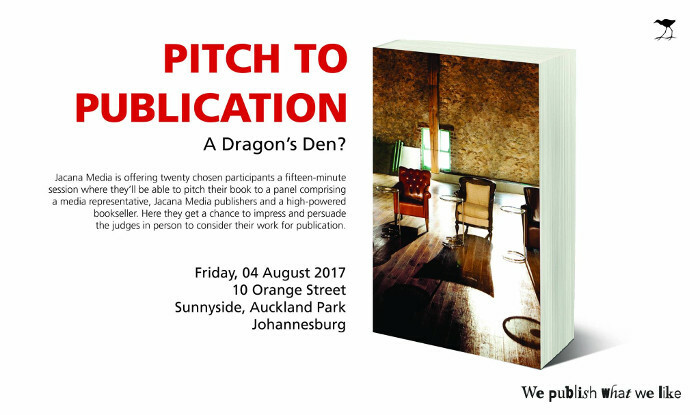 A Dragons’ Den-style, live pitching session, was held for the first time on 4 August 2017, with a selected 20 authors chosen to pitch from among the numerous submission hopefuls. The panel of dragons, Ben Williams, General Manager at Exclusive Books and founder of Johannesburg Review of Books, Michele Magwood, Sunday Times books loyalist, Thabiso Mahlape, publisher and founder of BlackBird Books and, from Jacana Media, Sibongile Machika, publisher, Andisiwe Madavha, organiser and submissions manager, and publishing director, Bridget Impey, sat down at a slightly too small table for what was going to turn out to be one of the most remarkable experiences of their collective publishing lives. ‘The whole of South Africa was here …’ – Michele Magwood said. And an amazing 5 out of the 20 presentations will be published in this coming year, and we are thrilled to announce the final selection. Vannesa Tedder – Beaten but not Broken will be published in July 2018. The live pitch session at Jacana was certainly a memorable and worthwhile experience for me as an aspiring author and definitely worth the trip and expense of flying in from Durban. I think often as aspiring authors and publishers the channels of communication are somewhat impersonal given that most if not all correspondence is conducted over email. The live pitch allowed for intimate interaction and the opportunity to really engage with each other, which emails and brief synopses cannot achieve. I would love to see more of such pitching happening as it will only serve to strengthen the case of aspiring authors when it comes to selling their story idea to publishers. Christel du Toit – Divorce Smart will be published in June 2018. I think your panel interview creates immediate access and exposure to both the author and the panel. For a ‘first-timer’ like me I could understand within 15 minutes how the industry is positioned, how it thinks, what you guys can and will do and will not do. I think it’s important to understand the distribution channels and partners in the business. This style of interview or presentation for me saved A LOT of time and TIME IS THE NEW MONEY! Mpho Dagada – How to Become a Millionaire at 21: Bitcoin will be published in May 2018. Pitching my book was quite an interesting experience, especially because of the high calibre of people who were in the panel. The panel was well-diversified and I received feedback that I could work with. I learnt a lot about my book through their feedback; points like the angle and focus I should use when writing. I enjoyed the fact that the whole experience was interactive, they stopped to ask questions, understood and went with the flow. Lerato Mogoatlhe – Vagabond: Wandering and Praying through Africa will be published in June 2018. From when I saw the call to submit I thought, ‘about time’. The traditional pitching process is passive and slow. It lacks heart and soul, and starts a creative process on a dull note, so I love the pitching session. The experience was phenomenal. Getting into panellists’ heads felt like a very current model of doing business – in real time. It was interactive and engaging. This is how manuscripts should be pitched. The session was worthwhile. Trying to publish a book feels like working with ghosts – generic emails, no faces and personalities behind the process. A live session cuts to the chase. I found comments, questions and feedback useful. They gave me different perspectives on my story. One of the toughest things for me has been getting a technical point of view of Vagabond, which the session offered. Wandile Ngcaweni – We are No Longer at Ease: Rhodes Must Fall and Youth Struggles for Decolonisation in South Africa will be published in August 2018. Initially I was very nervous and thought it would be an intimidating session; however, once I got into the room and we had done introductions I was put at ease by the friendly and professional nature of the panel. This resulted in the pitching session being very motivating. I got to interact and be assisted by some of the well-known publishing and book marketing industry leaders. I also got to meet and greet other participants who were going to pitch their manuscripts. The feedback I received was positively critical, it has motivated me to work harder to ensure that my manuscript is of high standard and quality. Follow Jacana Media on Facebook and Twitter for information on 2018’s pitching date.